Hail season is coming protect your home with 3m window film - Home Window Tinting & Commercial, Inc. Severe storms can have wreck severe havoc on your home, and windows are the weakest point and often damaged by hail. Not only can hail damage your windows, but the shattered glass creates serious safety risk for everyone inside the building. But there is something you can do to protect your property and loved ones. 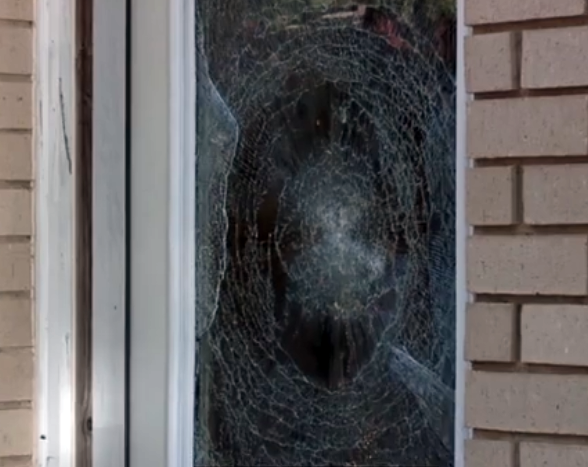 Safety and Security films will help prevent a shattered window from causing more damage. These films are applied on the inside of the window using a product called C-Bond. C-Bond is water based and non-toxic and third party laboratories have proven this product increases window strength in a variety of dangerous situations, including forced entry, 9 mm munitions, and severe windstorms. After the C-Bond is installed on the window, the 3M window film is applied. This film helps hold the glass together in the window frame after an impact. This prevents most of the glass from scattering across the floor and will continue to repel potential impacts such as hail. It is important to remember the attachment system though. While many safety film installers do not consider the attachment system integral to the security film, the attachment system is what keeps the film inside the window frame. Because a 1/16 inch gap exists between the film and the window frame, the attachment system is necessary to keep the glass from falling inside the window. These safety and security films come in a variety of strengths and shades, allowing you to customize your system to your needs. The thickness of the film can increase the strength, but at a certain point the film will become brittle and easier to tear making not all thickness ideal for your needs. The Majority of films we install are between 6 and 10 millimeters, although they can be as thick as 21 millimeters. These films can be clear, tinted, reflective, or even frosted depend on your needs and wants. With safety and security films you can sleep easier knowing that thieves cannot enter easily by simply breaking a few glass panes. And loses glass presents a serious danger during tornadoes and hail storms, but not if that glass is firmly attached to the window even after being broken. Everyone can stay safe during these terrifying moments. Home Window Tinting is a certified 3M Window Film Dealer Installer and can help you create a custom solution for your specific situation. Contact us today for a complimentary consultation. Let us help keep you, your loved ones, and your property safe. How does Residential Security Film work.